Back in '11 when they were just little beans heading off to school! Going back to school is never easy. First, there is the voluntary lists of things to buy. Like new tennis shoes that look 'just so', blue jeans that come from 'that store' and even lunchboxes and backpacks, which at this point 'are not too babyish, mom'. Then the involuntary lists arrive in our mailbox. The schools send requests for school supplies like pens, pencils, highlighters, paper and notebooks, etc., etc. More often than not, the school list will also include Kleenex, Lysol wipes, animal crackers and oh yes, the approximate number of 48 individual glue sticks. Really, do kids eat those glue sticks or what??? In our Naturally Sweet Sisters house, I also pick up things like sharps disposal containers, alcohol wipes, test kits for the locker and class rooms, glucose tabs and oh yes, the approximate number of 48 mini juice boxes. Thank you to the diabetes monster for making me throw those extra juice boxes in my red Target shopping cart! Life with type 1 diabetes takes that list a step further with meeting with the school nurse, the principal, the assistant principal and various teachers to craft both a care plan and a 504 document. So what I thought I would do is create a series of things that I have found useful to use over the years for helping my kids enjoy their school year as 'kids first, diabetes second'. Today's post is about a document that I created back in '06 to help my youngest daughter attend pre-school safely. 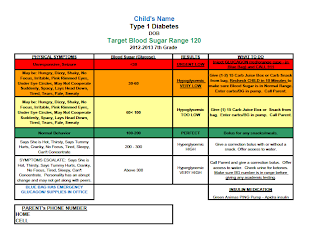 Since she was so little at the time, and also extremely shy, I thought having a quick reference sheet for the staff to refer to would be a huge help in determining her type 1 diabetes needs. 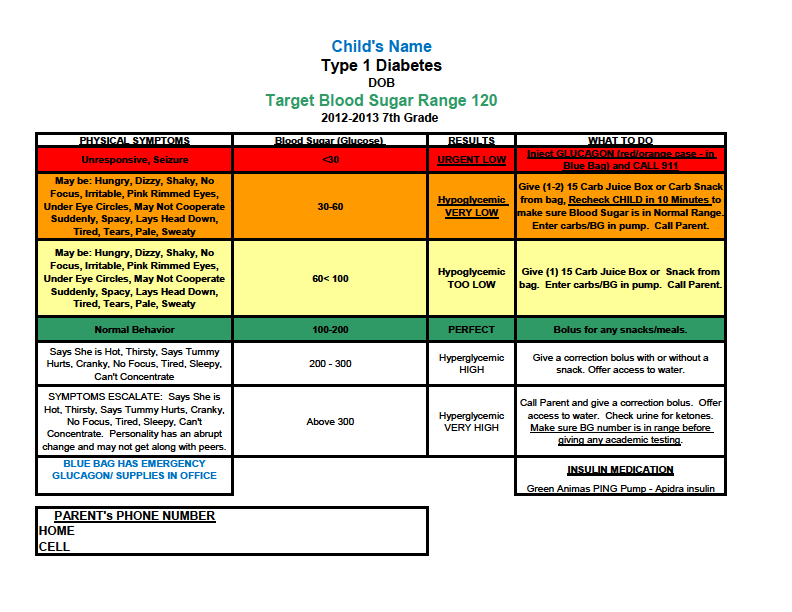 Here are the details up close..... your chart might read differently as everyone has their own unique diabetes care plan, symptoms and ways to manage hyper and hypoglycemia. Consult your pediatric endocrinologist for the way that is best suited for your family. This chart is an example only. Give (1-2) 15 Carb Juice Box or Carb Snack from bag, Recheck CHILD in 10 Minutes to make sure Blood Sugar is in Normal Range. Enter carbs/BG in pump. Call Parent. Give (1) 15 Carb Juice Box or Snack from bag. Enter carbs/BG in pump. Call Parent. Give a correction bolus with or without a snack. Offer access to water. SYMPTOMS ESCALATE: Says She is Hot, Thirsty, Says Tummy Hurts, Cranky, No Focus, Tired, Sleepy, Can't Concentrate. Personality has an abrupt change and may not get along with peers. Call Parent and give a correction bolus. Offer access to water. Check urine for ketones. Make sure BG number is in range before giving any academic testing. The staff loved it! They declared it to be a great relief to have a chart to refer to, especially as the world of type 1 diabetes was so new to them. The following year, our principal asked if we would feel comfortable sharing our chart with a neighboring elementary school. "Of course!" we said without hesitation and from there, it went to several different schools and through out our local JDRF support group. It made me feel proud that something that we created out of a need was actually useful to others. The sheet has been adapted to suit our daughters growing life and now, I actually print two copies, well about a 20 in reality, as I have two little girls living with type 1 diabetes. We have added instructions in our 504 plan to teachers to include this chart (with a picture) of our child(ren) for all use by all guest teachers and guest bus drivers. The secretaries at our large middle schools also used it to help staff (like custodians and food service) understand more about the way type 1 diabetes affects our children. All in all, it is one of the most important back to school documents that we send with our child. 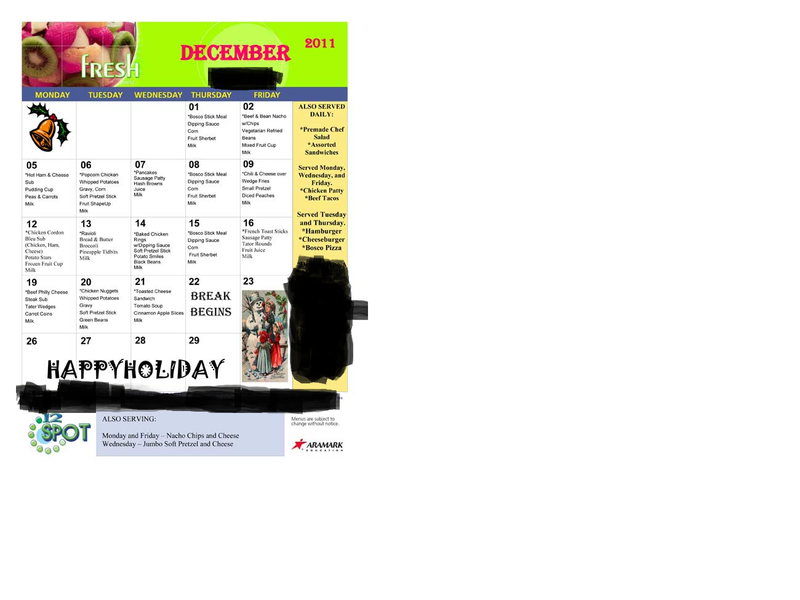 This is a PDF file. While you won't be able to make changes without converting it to an excel spreadsheet, you can also make your own version. At the very least, you can see a reference sheet from which to make your own copy. Tomorrow, I will post a reference for handling carb counts and packed lunches.